I visited the Wizarding World of Harry Potter at Universal Studios a few months ago. Being an avid Harry Potter fan, I was curious to know how the park would look and feel — and I was curious to know what the butterbeer would taste like! I was skeptical — mainly because I don’t like super, super sweet ANYTHING. I tried the frozen butterbeer and it was a-m-a-z-i-n-g. I would have had a second and third and fourth glass if I didn’t have a conscience that told me, “stop – there are probably 1,000 calories in one glass!” The theme park itself was also amazing and you really did feel like you were *in* the books. The employees even referred to the patrons as muggles. I found a recipe for butterbeer CUPCAKES and had to try! 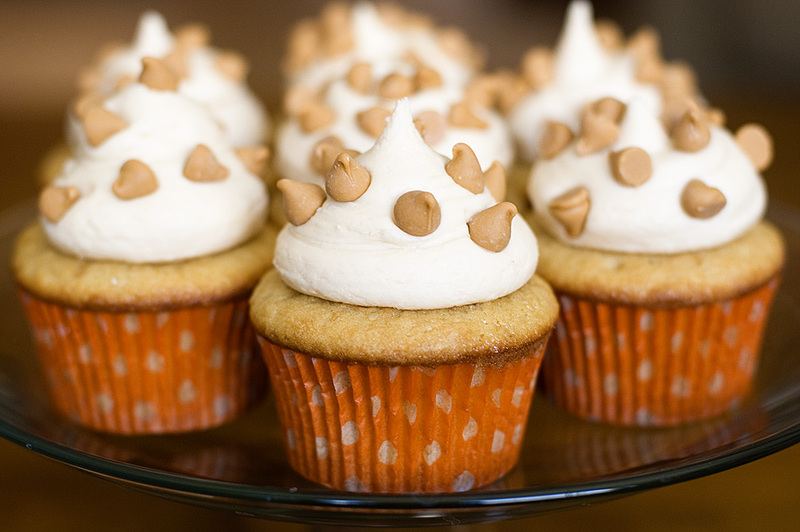 They are filled with butterscotch and cream soda flavors and really do taste like the butterbeer at the park! 1. Preheat the oven to 350 degrees and line cupcake pans with paper liners. 2. Combine your flour, baking soda, baking powder, and salt in a bowl and set aside. 3. In a large bowl, cream your butter until light and fluffy. Add your sugars and beat until well-combined. Beat in your eggs, one at a time, mixing well after each addition. Then beat in your vanilla and butter flavoring. 4. Alternate adding your buttermilk, cream soda, and dry ingredients in batches until all are well incorporated. 5. Fill each cupcake liner 3/4 full, then bake for 15 to 17 minutes until a tester inserted into the center comes out clean and cake springs back to the touch. Cool completely on wire racks. 1. In a double boiler (heat-proof bowl over a pot of simmering water on the stove), combine butterscotch chips and heavy cream and stir until completely combined and smooth. 2. Cool to room temperature. 3. Fill a squeeze bottle with ganache and insert into the center of each cupcake, squeezing until filling begins to overflow. 1. Cream butter in a large bowl until fluffy. Add in ganache, vanilla, butter flavoring, and salt and mix until well combined. 2. Beat in powdered sugar 1 cup at a time until reaching desired consistency. Add milk or cream by the Tablespoon as needed. 3. Frost cupcakes. You can top with a drizzle of ganache or with butterscotch chips. Tracy — I saw your butterbeer cake! It looked amazing. I have it bookmarked and on my “to try” list :) Gotta love Harry Potter.